Winston came to us directly from The Peterborough Humane Society, after being adopted by the wonderful Mahoney family. His background was unknown, but they simply wanted to ensure that his transition process was a successful one for all. 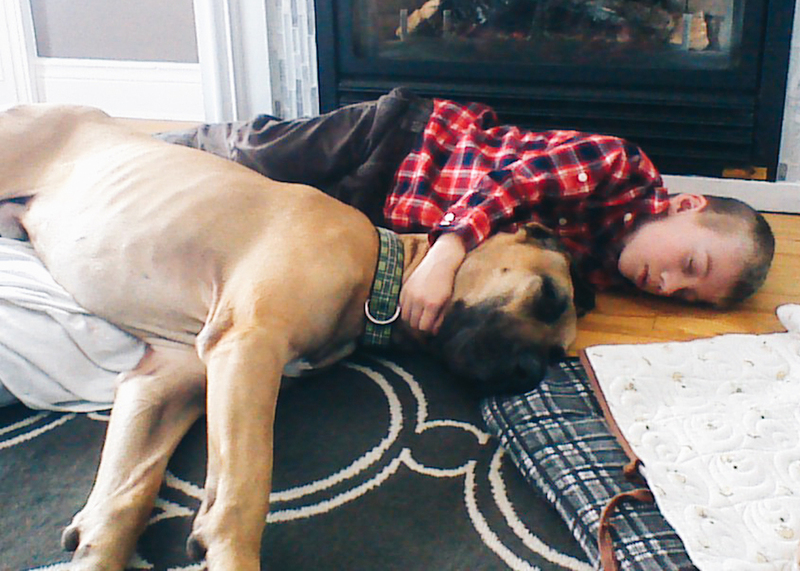 "We've just adopted a 3 year old Great Dane from the humane society in Peterborough. We hope he'll make a wonderful friend for our 2 year old Boxer. His owners surrendered him, after nearly starving him to death. We have no other history. 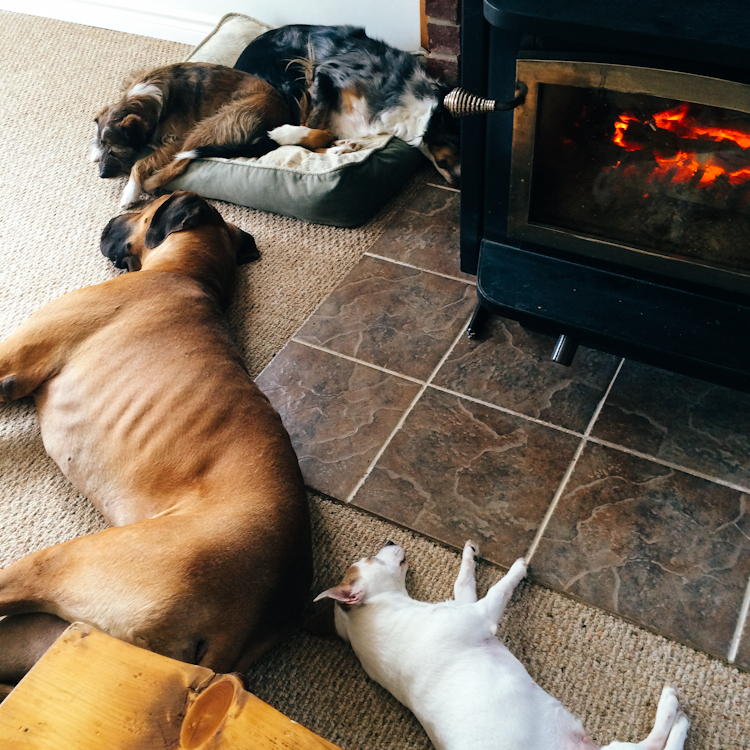 Our boxer is relatively calm, and pretty lazy... spending most days curled up in front of the fire. However, we deal with his over excitement every time someone comes over. Seamus met our Great Dane, Winston, today at the humane society, and they seemed to enjoy eachothers' company. Winston doesn't seem to have any behavioural issues, but a dog in a kennel is surely not the same dog he'll be in our home. We have 5 children, 4 of them still at home- ages 10, 9, 7, and 5. 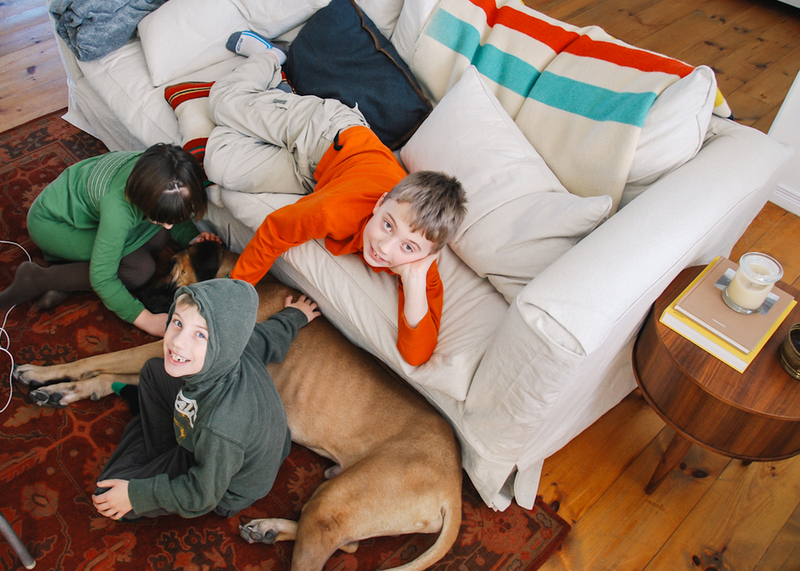 Our main priority is the safety of our kids and both dogs. Winston is almost at full weight and is set to arrive on Friday, as he's being neutered on Thursday. We know he needs a full grooming as he's quite dirty from the shelter. I'm hoping we could arrange for him to come directly to you. We'd like to determine if there is anything we can do to make his life better as he adjusts to us, and us to Seamus. For now we're making room for the giant, and awaiting any info you have." Winston's Stay at The P.A.R.C. A week after our first contact, Winston was neutered and brought directly to The P.A.R.C. to begin his new journey. Upon his arrival, Winston's behaviour was fairly neutral. He was a bit nervous, but more curious than anything. He was also carrying a lot of pent up energy, and because of his size, this was my only real concern and what I would first address. Although his shelter experience was a short one, we also had to take into consideration, the fact that he was a victim of extreme neglect. 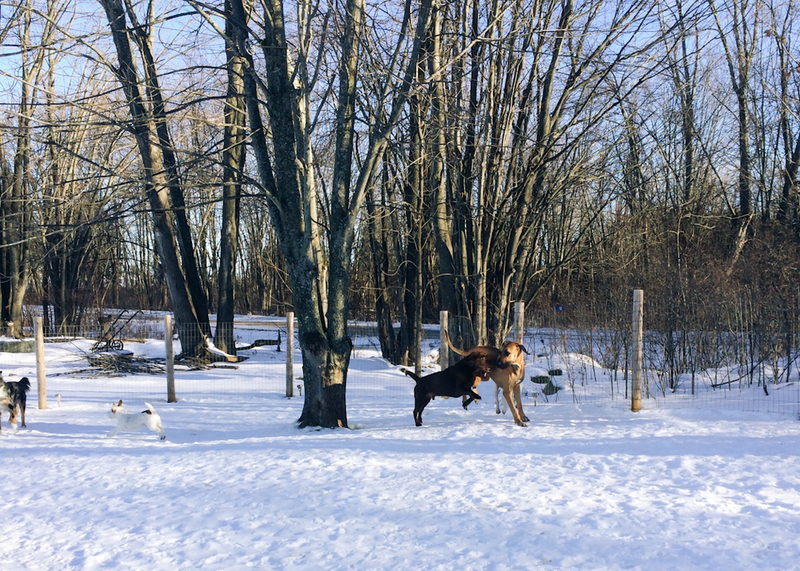 Once integrated into The Pack, and our bond with Winston was firmly established, my focus was to simply remind him of all the rules, boundaries and limitations. Constant repetitions were a must when dealing with Winston's size and energy, to ensure he would prepared for his new life in a family with 4 young children. Here, The Pack helped with giving Winston an outlet to drain his energy, as well as with all the rituals and routines that would help him recover a more balanced state of mind. Winston was born to be a follower. He thrived off being given direction and an overall calm-asseritive energy. When Winston was ready to go home, we had his entire family come to be present for the initial meeting. It was important that the children know how to approach Winston, and how to handle the various responsibilities they are given in caring for him. 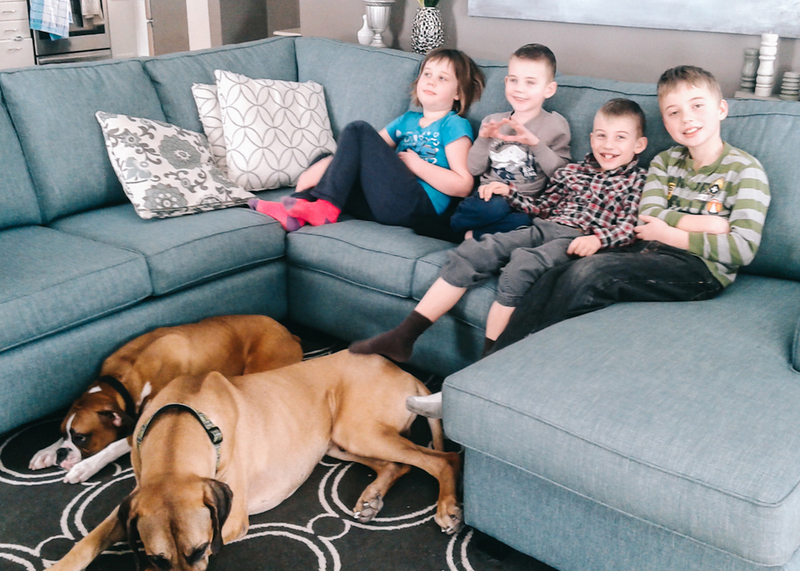 When Winston met the kids, not only was the introduction a total success, but we were thrilled to hear that he would play an extra special role for one of the Mahoney children, who has Asperger Syndrome, an autism spectrum disorder. Winston clearly gravitated immediately to Liam. The moment they touched, Winston's energy shifted and you could instantly feel he took on a different role. To watch a bond unfold and witness this gentle giant share a therapy that only mother nature can provide, was truly an honour. It confirmed for us, that he would now have the right family and home to make this process a total success -- compatibility is huge when adopting. During the visit, we discussed any observations I made regarding Winston's behaviour, as well as ways they should handle day to day life with two dogs. We also took time out to learn the feeding ritual, and each child got a turn to practice the correct way to feed Winston. Come the warmer weather, I will be following up with Winston and his new pack, and help them with things like the walk, and off leash exercises. After two weeks at The Dog Parc, we welcomed this gentle giant into our home. Winston, or Winnny, as the kids are calling him, is great! He has made a wonderful addition to our family. He and Seamus eat side by side now, in our presence of course, and have had no issues. They love a good wrestle in the morning, and spend the rest of the day napping together (on the same bed) by the fire. He is especially fond of Gavin, our 7 year old, who loves to snuggle. Liam is doing well with Winston. He hasn't developed a really emotional relationship with him, but does do a lot of his care. Liam builds most of is human relationships that way also, so it isn't unexpected. I did see the two of them snuggled up on the floor last night, and that is a really special thing. Winston's bed is beside Liam's bed upstairs, and I think Liam feels a bit of responsibility for him. Which is great for Liam's confidence. Seamus's excitement issues are nearly resolved, partly because of the great example Winston shows him, but also because of the advice Sonny gave us. 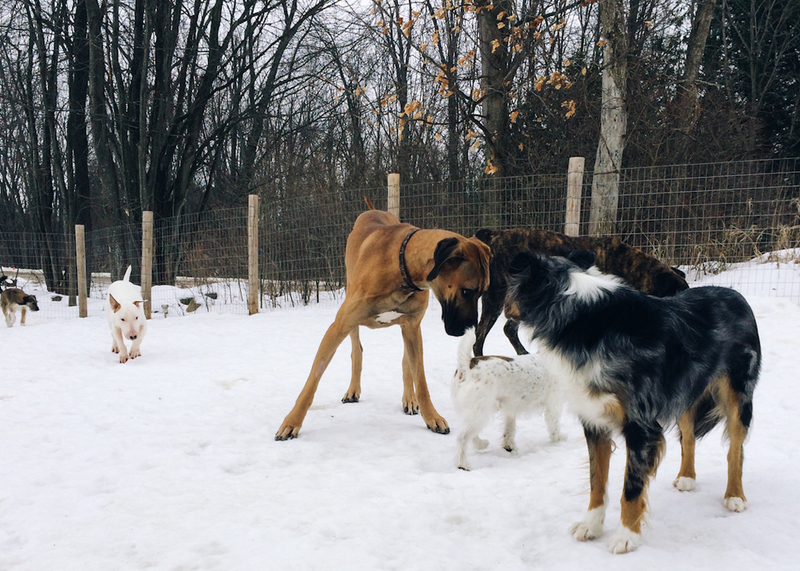 We are feeling completely in charge, which is so important when you love such a big dog. Sonny, you gave us peace of mind as well as the tools to keep our dogs happy and healthy.